OR Air Supplemental System reduced mean bacterial CFU/m³ by 57%. Environmental risk factors include the presence of airborne viable microorganisms in the OR air, in close proximity to the surgical wound. Bacterial cells can be transported on dust, skin scales, fabric fibers and respiratory or mechanically-generated aerosols. OR air quality should be scrupulously monitored during surgical procedures involving the use of implants. It is well established that contamination of a surgical implant and subsequent development of SSI can occur with a very small bacterial inoculum, eventually, leading to biofilm formation and establishment of a chronic, drug-resistant and costly infection. In light of recent scientific data there is increased interest in considering innovative supplemental technologies to support best air quality in high risk ORs. 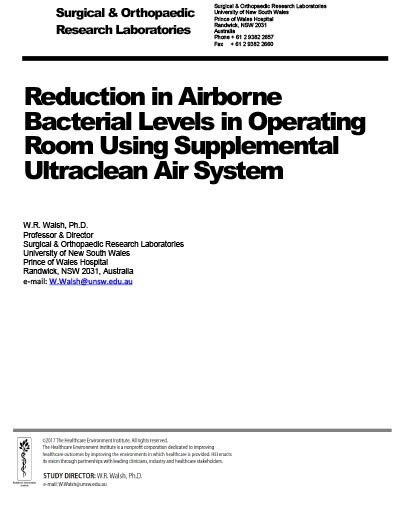 This study was designed to test the efficacy of the innovative HEPA/UV-C supplemental ultraclean air system (SUCAS) on reducing airborne bacterial levels in an active orthopedic OR. 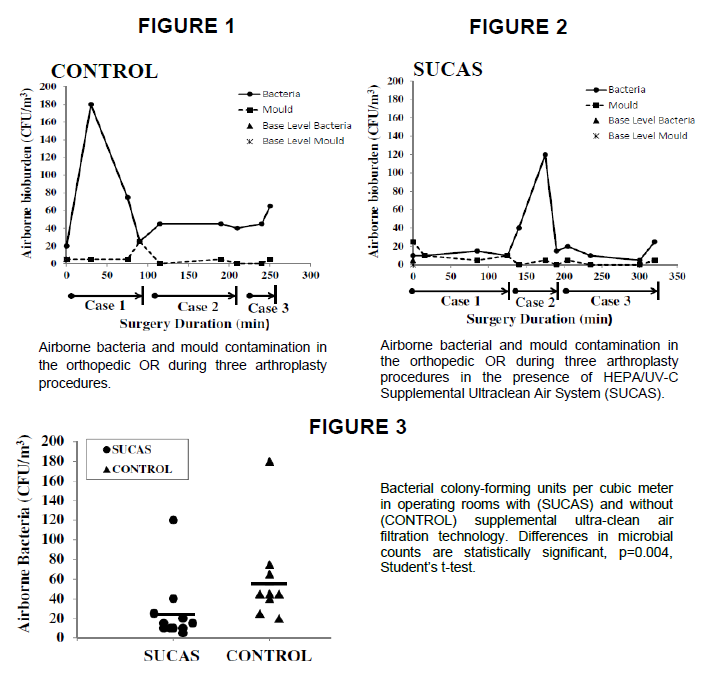 To test the efficacy of SUCAS system in reducing airborne bioburden, two arthroplasty operating rooms were selected for evaluation. Overall, presence of SUCAS system reduced mean bacterial CFU/m³ by 57%, the difference is statistically significant, p=0.004.